I watched the movie Ender's Game recently. Yes I know it's from 2013, but I haven't got the chance to see it until now. But when I watched it, I couldn't help thinking of how similar the story is in Brandon Sanderson's latest book Skyward. It's kinda obvious that Orson Scott Card's book Ender's Game has influenced Brandon Sanderson quite a bit. I mean, in Ender's Game a boy called Andrew "Ender" Wiggin, that is an unusually gifted child, is sent to an advanced military academy in outer space to prepare for a future alien invasion. And in Brandon Sanderson's book Skyward, the world has been under alien attack for decades, and a girl called Spensa is dreaming to become a pilot. Pilots are the heroes of what’s left of humanity, and Spensa desperately wants to attend flight school. And in both stories, the kids is doing war by playing "games" more or less. They are training in war simulators. In fact , very similar. And of course, in both stories the main characters are doing revolt to the authorities. Brandon Sanderson having Ender's Game as an influence for the book Skyward is nothing wrong though. It's a good story. 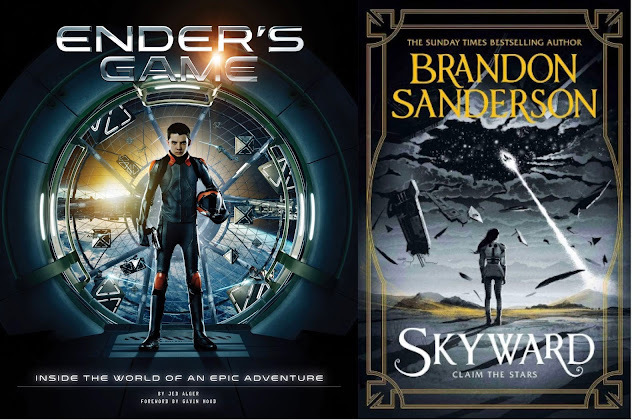 And I liked Skyward when I read it, but it was not until after I watched the movie Ender's Game that I realized how similar the two stories was. I can highly recommend both Skyward and Ender's Game.